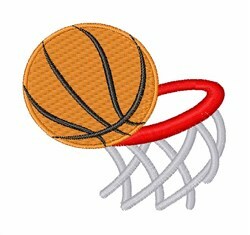 This slam-dunk design is perfect for basketball enthusiasts on towels, tote bags, sweatshirts and more! Easy Embroidery is happy to present Basket ball & hoop machine embroidery design which has 5520 stitches and is [63.56 mm x 63.40 mm] large. If you would like to view more embroidery patterns please search on our embroidery designs page.